1) Wash and cut up the ribs. 2) Mix all the sauce ingredients together. The numbers are portion, so you can use tea spoon, table spoon, cup or even barrel if you like… as long as you follow the portion, then the taste should turn out right. 3) Pour the sauce in a deep pot. When the sauce boils, put the ribs in. When it boils, turn down the heat to medium and let it simmer for about 10-15 minutes. Stir occasionally. The sauce will caramelize and thicken. If you don’t like thick sauce, turn the heat to low and simmer it for shorter time. 1) You can substitute the ingredients with whatever you have at home, as long as the substitute has the same taste as the original ingredient. I’ve used brown sugar, Japanese sake before, and my co-worker has used white vinegar as a substitute as well. They all turned out quite fine. 2) My co-worker told me that she doesn’t use 4 portions regular soy sauce. Instead, she uses 2 portions of light soy sauce, and 2 portions of dark soy sauce. I’ve tried both ways . 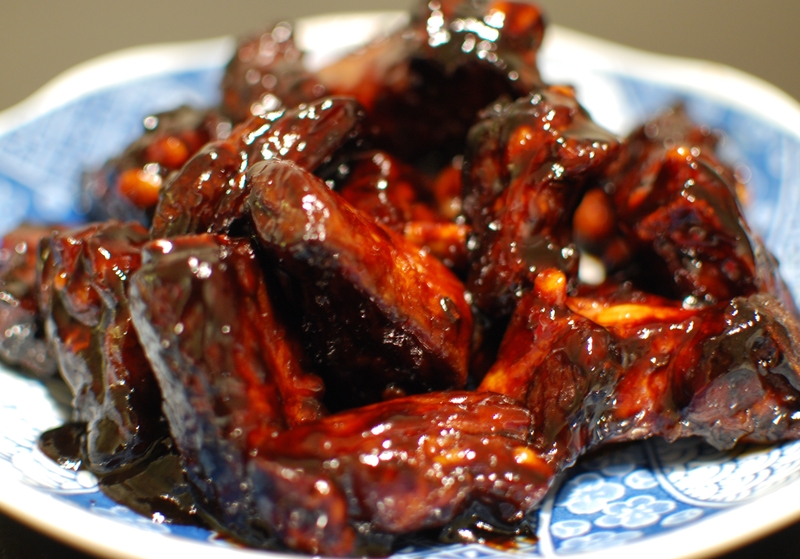 The ribs cooked with the 2-2 light/dark soy sauce is a lot darker than the 4 soy sauce. It’s because dark soy sauce is a lot darker, and it gives the food the colour. (This time I used 2-2 light/dark soy sauce. 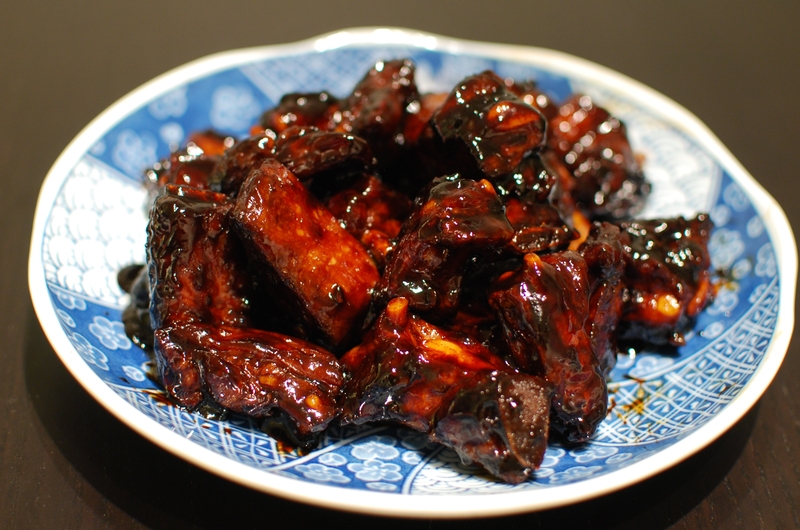 The ribs are really dark.) Taste-wise, I’m not sure if there’s a significant difference, because everytime I make it, I change the ingredients a bit… so I’m not sure if the difference is from the soy sauce or something else. 3) I’ve used this sauce to make chicken wings before… it was actually pretty good! 🙂 Give it a try! 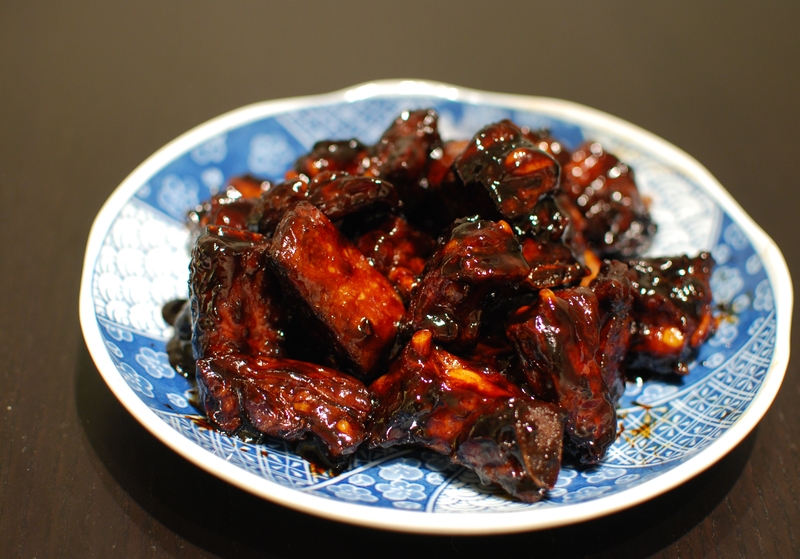 This entry was posted on April 7, 2011, 12:34 am and is filed under Chinese, Meat. You can follow any responses to this entry through RSS 2.0. You can leave a response, or trackback from your own site. Love it! My mouth totally watered from the picture. Question about the rose wine: Does it give much taste to the product, compared to other cooking wines?